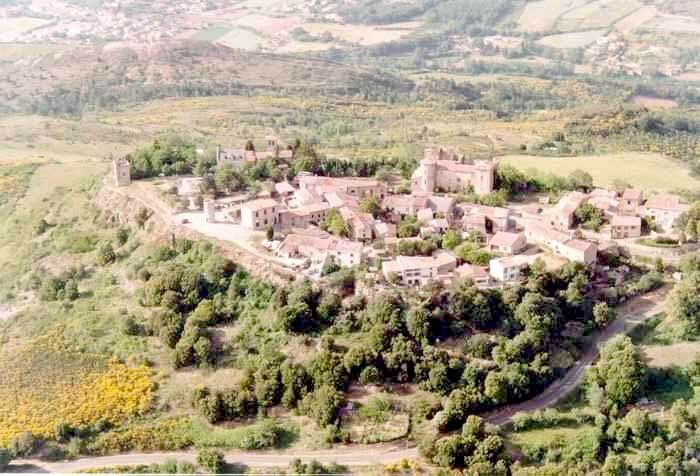 Rennes Le Chateau, is located in Languedoc, France an unspoiled area of southern France. There are many mysteries surrounding Rennes Le Chateau that link with the Holy Grail, the Ark of Noah, the Ark of the Covenant and the treasures of the Temple of Solomon. These mysteries have baffled researchers for hundreds of years. The area surrounding Rennes Le Chateau leaves is a virtual playground for the 'sacred geometry archtetects'. There are 40 square miles of landscape geometry to rowk with. According to one researcher, it may be laid out in the shape of a "Ship of the Dead" with a helmeted warrior borne to sea. Yet another thinks that the Paris Meridian may have been drawn so that it quite deliberately passes, ley-fashion, straight through Rennes Le Chateau, Arques, and Conques. Others see links between the site and Rosslyn Chapel in Scotland or Shugborough Hall in Staffordshire, England. This predominantly rural area has a very rich history, as evidenced by its castles, cathedrals, vineyards and museums. Mountains frame both ends of the region - the Cevennes to the northeast and the Pyrenees to the south. Jagged ridges, deep river canyons and rocky limestone plateaus, with vast caves beneath, make it one of the most scenic spots on Earth. Over the centuries religious and political conflicts have caused much havoc in the area. The ruined castles which cling precariously to hilltops played a leading role in the struggles between the Catholic church and the Cathars at the beginning of the 13th century. Others guarded the volatile border with Spain. Whole communities were wiped out during the campaigns of the Catholic authorities to rid the area of the Cathar heretics during the Albigensian Crusades and later, when Protestants fought for religious freedom against the French monarchy. The modern reputation of Rennes-le-Ch�teau rises from rumors concerning the local priest in the late nineteenth century, B�renger Sauni�re, who was alleged to have mysteriously acquired and spent large sums of money. He was even said to have visited several heads of state, though there is no evidence for this whatsoever. These rumors were given wide local circulation in the 1950s by Noel Corbu, a local man who had opened a restaurant in Sauni�re's former estate. He probably hoped to increase his business. They moved from local to national importance when they were incorporated by Pierre Plantard into his mythology of the Priory of Sion, which influenced the authors of the popular 1982 book Holy Blood, Holy Grail. From this point on Rennes-le-Ch�teau became the center of conspiracy theories claiming that Sauni�re uncovered hidden treasure and/or secrets about the history of the Church that threatened the foundations of Catholicism. Since the mid-1950s, the area has become the focus of increasingly sensational claims involving the Knights Templar, the Priory of Sion, the Rex Deus, the Holy Grail, the treasures of the Temple of Solomon, the Ark of the Covenant, ley lines, geometric alignments, and others. Elements of these ideas were later incorporated into Umberto Eco's 1989 novel Foucault's Pendulum, Dan Brown's bestselling 2003 novel 'The Da Vinci Code', and computer game Gabriel Knight III. The village now attracts visitors who look for hidden treasures and evidence of conspiracy, much to the displeasure of the locals. Almost all historians reject these conspiracies as nothing more than fantasy. I would agree. According to writers such as Paul Smith, Monsignor George Boyer in 1967 (Vicar General of the parish of Carcassonne), Rene Descadeillas, Jacques Riviere, Jean-Luc Chaumeil, Jean-Jacques Bedu, Vincianne Denis, Bill Putnam, John Edwin Wood, and Marie Francine Etchegoin - the stories of Sauni�re's "mysteries" were based on nothing more than a minor scandal involving the sale of masses, which eventually led to the disgrace of both Sauni�re and his bishop. His 'wealth' was short-lived and he died relatively poor. Other aspects of the Rennes-le-Ch�teau mythology derive from forgeries created on behalf of Plantard. Sauniere died in 1917, leaving the secret of where he got his fabulous wealth to his housekeeper, Marie Dernaud, who promised to reveal it on her deathbed - but sadly she had a stroke which left her paralyzed and unable to speak before her death in 1953. Speculation was rife on the source of the parish priest's money. Was it the lost treasure of the Knights Templar or the Cathars in the area? Might it have been buried Visigothic gold? 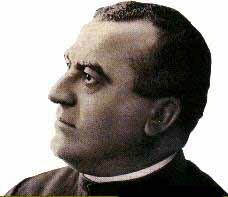 Was Sauniere blackmailing the Church with some terrible secret? The evidence that points to the last possibility is that Sauniere's confession before his death was so shocking that the priest who heard it denied him absolution and last rites. The mystery is rendered greater by a series of parchments found by the cleric in 1891, which contained an easily discovered cipher. They were apparently written by his predecessor, Abbe Antoine Bigou, confessor to Marie d'Hautpoul, in 1781. The same cipher appears on her tombstone. The parchments were, on the face of it, Latin transcriptions of passages from the Gospels, but they contained deeper mysteries. Sauniere also appears to have left certain other "clues" in the highly unusual redesign of his church and of the other structures in the area. 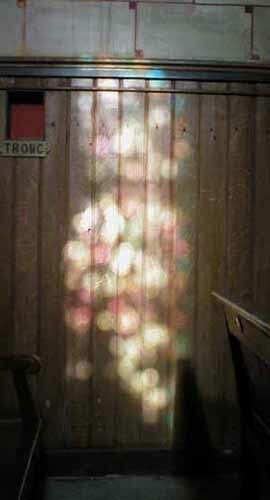 The name 'Blue Apples' or 'Pommes Bleues' in French, relates to an optical phenomenon that is said to occur at midday (12:00) on January 17 when the sun shines through a stained-glass window (Jesus Raising Lazarus from the Dead) in the church. 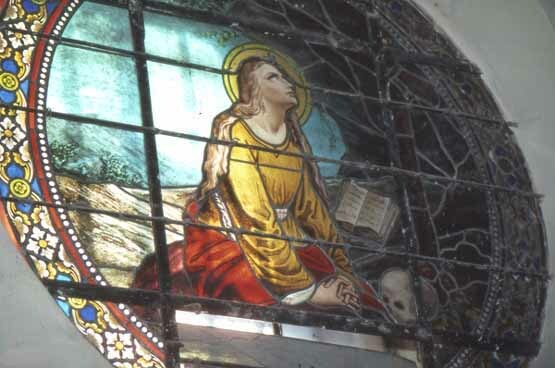 On this day, orbs of bluish light appear on the church furnishings before stopping (then fading) on the altar with its bas-relief of Mary Magdalene kneeling in prayer with a skull at her knees. The most bizarre chapter in the story of Rennes-le-Chateau may have to do with the Money Pit mystery on Oak Island just off Nova Scotia. According to Michael Bradley, some of the keepers of the Grail may have come to the New World long before Columbus. He believes that some of the Templars may have fled to Canada after the dissolution of their order, carrying the Grail. The Money Pit has more often been associated with pirates' buried treasure, but as many know, the "Jolly Roger" flag's skull-and-crossbones icon has long been associated with Masonic and Templar legend. The Zeno map refers to a map of the North Atlantic first published in 1558 in Venice by Nicolo Zeno, a descendant of a person by the same name, Nicolo Zeno, of the Zeno brothers. The younger Zeno published the map, along with a series of letters, with the claim that he had discovered them in a storeroom in his family's house in Venice. According to his claim, the map and letters were made around the year 1400 and purport to describe a voyage by the Zeno brothers made in the 1390s under the direction of a prince named Zichmni. The voyage supposedly traversed the North Atlantic and, according to some interpretations, reached North America. Most historians today regard the map and accompanying narrative as a hoax, perpetrated by the younger Zeno to retroactively put forth a claim for Venice as having discovered the New World prior to Christopher Columbus. The evidence against the authenticity of the map is based largely on the appearance of many non-existent islands in the North Atlantic and off the coast of Iceland. One of these islands was Frisland. In the Money Pit on Oak Island, a mysterious stone inscription was found: "Forty feet below - two million punds are buried." Every company that has tried to locate this treasure has failed. 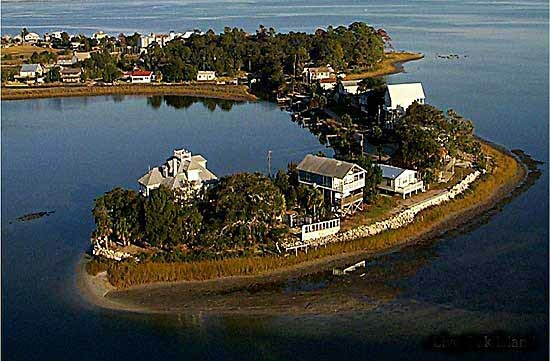 Oak Island is noted as the location of the so-called Money Pit, a site of numerous excavations to recover treasure believed by many to be buried there. However, the pit may have been a sinkhole or some other natural formation that was misinterpreted for centuries. The island is privately owned and advance permission is required for any visit. Mid-19th century newspaper stories recount that in 1795, young Donald Daniel McInnis discovered a circular depression on the south eastern end of the island with an adjacent tree which had a tackle block on one of its overhanging branches. McInnis, with the help of friends John Smith and Anthony Vaughan, excavated the depression and discovered a layer of flagstones a few feet below. On the pit walls there were visible markings from a pick. As they dug down they discovered layers of logs at about every ten feet (3 m). They abandoned the excavation at 30 feet (10 m). About eight years later, according to the original 19th century article, another company examined what was to become known as the Money Pit. The Onslow Company sailed 300 nautical miles from central Nova Scotia near Truro to Oak Island with the goal of recovering what they believed to be secret treasure. They continued the excavation down to approximately 90 feet (27.43 m), and found layers of logs or "marks" about every ten feet (3 m) and layers of charcoal, putty and coconut fibre at 40, 50 and 60 feet (12, 15 and 18 m). According to one of the earliest written accounts, a newspaper article called "The Oak Island Diggings" from the Liverpool Transcript (Oct 1862) at 80 or 90 feet (27 m) they recovered a large stone bearing an inscription of symbols. The pit subsequently flooded up to the 33 foot (10 m) level. Bailing did not reduce the water level and the excavation was abandoned.Investors formed The Truro Company in 1849, which re-excavated the shaft back down to the 86 foot (26 m) level where it flooded again. They then drilled into the ground below the bottom of the shaft. According to the 19th century account, the drill or "pod auger" passed through a spruce platform at 98 feet (30 m), a 12 inch head space, 22 inches (560 mm) of what was described as "metal in pieces", 8 inches (200 mm) of oak, another 22 inches (560 mm) of metal, 4 inches (100 mm) of oak, another spruce layer, and finally into clay for 7 feet without striking anything else. One account states they recovered three small gold links of a chain from mud stuck to the drill. They attempted to prevent the pit from flooding by damming Smith's Cove, and later by excavating a shaft into what was believed to be a flood tunnel from the sea to block it and prevent the pit from filling with water. The original 18th Century story of the pit's discovery along with the mid-19th century newspaper accounts are based on unverified folklore and may be entirely false. The earliest published description of the Money Pit is a news article in the Liverpool Transcript newspaper in October 1862. This included an oral account of the early years of excavation attempts as told by at least one digger. No supporting material or evidence has surfaced ever since and the story has been impossible to verify. Several researchers have noted that artifacts like the inscribed stone and gold chain links could have been placed in the pit during expensive excavation operations for the purpose of attracting more investors. The Money Pit was first mentioned in print by the Liverpool Transcript in 1857. More accounts followed in the Liverpool Transcript, the Novascotian newspaper and A History Of Lunenburg County *, but this last account was based on the earlier Liverpool Transcript articles and does not represent an independent source.The next excavation attempt was made in 1861 by a new company called the Oak Island Association and apparently led to the collapse of the bottom of the shaft into a suspected void or booby trap underneath. The first fatality during excavations occurred when the boiler of a pumping engine burst. The company gave up when they exhausted their funds in 1864. Numerous further excavations were made in 1866, 1893, 1909, 1931,1935, 1936, and 1959, none of which were successful. Franklin Roosevelt (later President of the United States) was part of the Old Gold Salvage group of 1909 and kept up with news and developments for most of his life. About six people have been killed in accidents during various excavations. In 1928, a New York newspaper printed a feature story about the strange history of the island. Gilbert Hedden, operator of a steel fabricating concern, saw the article and was fascinated by the engineering problems to be overcome in recovering the treasure. Hedden collected a library of books and articles on the island and made six trips there. Wholly believing that there was treasure buried on Oak Island, Mr. Hedden even ventured to England to converse with Harold Tom Wilkins the author of Captain Kidd and His Skeleton Island. Hedden believed he had found a link between Oak Island and a mysterious map in Wilkins' book. Convinced that the story was no hoax, the very wealthy Hedden bought the southeast end of the island. He did not start to dig until the summer of 1935 after excavations by William Chappell in 1931. The 1931 excavations by William Chappell sank a 163 foot shaft 12x14 feet to the southwest of what they believed was the site of the 1897 shaft, close to the original pit. At 127 feet a number of artifacts, including an axe, anchor fluke and pick were found. The pick has been identified as a Cornish miner's poll pick: By this time the entire area underlying the Money Pit was littered with the debris and refuse of numerous prior excavation attempts so it it is unlikely this pick belonged to the original party (if any) that created the hole. In 1965, Robert Dunfield leased the island and, using a 70 ton digging crane with a clam bucket, dug out the pit area to a depth of 140 feet (43 m) and width of 100 feet (30 m). The removed soil was carefully examined for artifacts. As a result the location of the original shaft is no longer known. Transportation of the crane to the island required the construction of a causeway (which still exists) from the western end of the island to Crandall's Point on the mainland two hundred metres away. Around 1969, Daniel C. Blankenship and David Tobias formed Triton Alliance, Ltd. and bought most of the island. In 1971, Triton workers excavated a 235 foot (72 m) shaft supported by a steel caisson to bedrock. Cameras lowered down the shaft into a cave below were said to have recorded some chests, human remains, wooden cribbing and some tools but the images were not clear and none of these claims have been confirmed. The shaft subsequently collapsed and the excavation was again abandoned. This shaft was later successfully re-dug to 181 feet, reaching bedrock where work was halted due to lack of funds. The Money Pit Mystery was the subject of an episode of the television series In Search of... which first aired January 18, 1979, bringing the legend of Oak Island to a wider audience. Previously the story had only been known among locals, treasure hunting groups and readers of sensational magazines and anthologies.As of 2005, the island is for sale with an estimated price tag of $7 million. 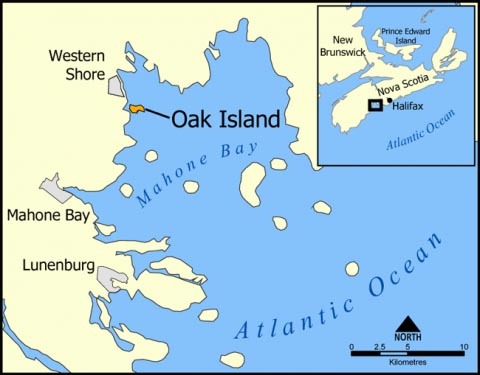 A group called the Oak Island Tourism Society hopes the government of Canada will purchase the island. Treasure hunters had discovered coconut fibres beneath the surface of one beach (coconuts are not indigenous to Nova Scotia). This led to suggestions the beach was converted into a giant "wick", feeding water from the ocean into the pit. However, coconut fibres were used as shipping dunnage and the fibres may have been discarded from cargo ships stopping at the island or sailing nearby. Also, the island lies on a glacial tumulus system and is underlain by a series of water-filled limestone cavities (Anhydrite) which could be responsible for the repeated flooding of the pit. Bedrock lies at a depth of 160-180 feet in the Money Pit area. Upon the invitation of Boston area businessman David Mugar a two week survey was conducted by the Woods Hole Oceanographic Institution in 1995, the only scientific study ever conducted on the site. After running dye tests in the bore hole, they concluded that the flooding was caused by a natural interaction between the island's freshwater lens and tidal pressures in the underlying geology, refuting the idea of artificially constructed "box drains" or flood tunnels. Scientists also viewed some of the videos taken in 1971 and concluded that nothing of value could be determined from the murky images. There has been wide speculation about what the pit might contain. Most suggestions include treasure buried by either Captain Kidd, British troops during the American revolution, Spanish sailors from a wrecked galleon, the Inca or even exiled Knights Templar hiding the Holy Grail in the pit. The notorious pirate Blackbeard claimed he buried his treasure "where none but Satan and myself can find it," leading to inevitable suggestions that he dug the pit but there is no evidence to support this. Perhaps the most far-fetched theory is that English philosopher Francis Bacon used the pit to hide documents proving him to be the author of William Shakespeare's plays. The pit may contain nothing at all. Since the 1970s fewer people have believed the pit has any connection to pirates, due to the massive scale of the subterranean structure and its similarity to other natural formations found in the area. Given the limited size of the original pit it may be noteworthy that no debris, lost tools or other items mentioned in the early accounts have been found. There is no surviving evidence that any elements described in the original tale (such as oak platforms, an inscribed stone, or even the tree itself) ever existed, although few details have changed since the original version of the story was published. Some elements contained in the Oak Island story, such as the discovery of tantalizing but inconclusive objects and a message in indecipherable code, are common in fictional works on treasure and piracy (such as the Edgar Allan Poe story The Gold Bug). This has led to speculation that the early account of the Money Pit is a combination of several works of 19th century fiction conflated with a local story about a search for buried treasure. Recent research has uncovered possible connections between the pit's 19th century pre-publication history and founders of the Mormon Church along with Masonic elements in the story's earliest oral forms, which could further indicate conflation of its origins or mis-interpretation of the site. The introduction of the LDS is suspect, as the contributor was fired by the company exploring for treasure and is seen as a person with an axe to grind.